Thomas Alva Edison (February 11, 1847 — October 18, 1931) was an American inventor and businessman, who has been described as America’s greatest inventor. Edison’s signature invention is the light bulb. And his Incandescing Electric Lamp, one of Edison’s 1,093 inventions, was patented on October 30, 1883. Without a doubt, he was one of the most productive inventors in American history. Edison’s inventions contributed to mass communication and, in particular, telecommunications. These included a stock ticker, a mechanical vote recorder, a battery for an electric car, electrical power, recorded music and motion pictures. “Five feet ten inches high, with boyish but earnest face, light gray eyes, his dark hair slightly gray falling over his forehead, his hat tipped to the back of his head, as he goes ardently to his work, which has averaged eighteen hours a day for ten years, he is indeed a pleasant man to see. Orison Swett Marden, an American inspirational author who wrote about achieving success in life and founded SUCCESS magazine in 1897, once set out to discover the secret to Edison’s success. In his book, How They Succeeded: Life Stories of Successful Men and Women Told by Themselves (1901), Marden reveals Thomas Edison’s work habits, self-described by Edison himself. The book was republished by the Mises Institute in 2011. ‘Do you have regular hours, Mr. Edison?’ I asked. “Fourteen of 15 hours a day can scarcely be called loafing,” I suggested. When he was 47 years old, he estimated his true age at 82, since working only eight hours a day would have taken till that time. 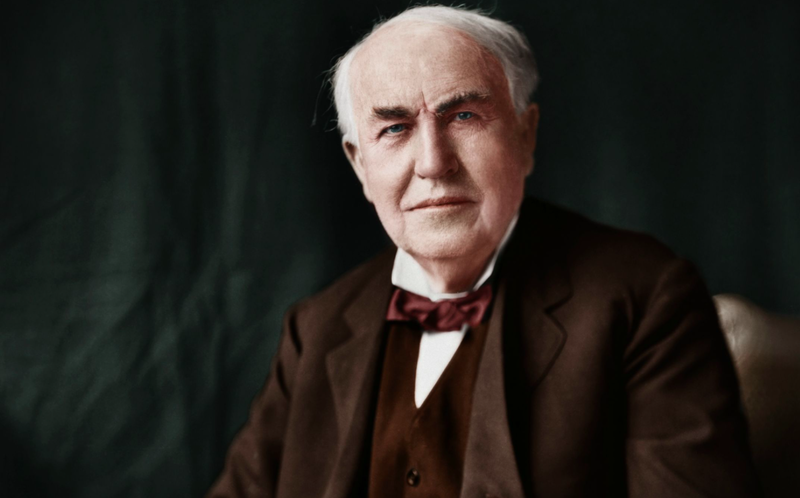 Mr. Edison sometimes worked 60 consecutive hours upon one problem. Then, after a long sleep, he was perfectly refreshed and ready for another. “Are your discoveries often brilliant intuitions? Do they come to you while you are lying awake nights?” I asked him. “I never did anything worth doing by accident,” he replied, “nor did any of my inventions come indirectly through accident, except the phonograph. No, when I have fully decided that a result is worth getting, I go about it, and make trial after trial, until it comes. “Not at all,” he said. “You do something all day long, don’t you? Everyone does. If you get up at seven o’clock and go to bed at eleven, you have put in sixteen good hours, and it is certain with most men, that they have been doing something all the time. They have been either walking, or reading, or writing, or thinking. The only trouble is that they do it about a great many things and I do it about one. If they took the time in question and applied it in one direction, to one object, they would succeed. 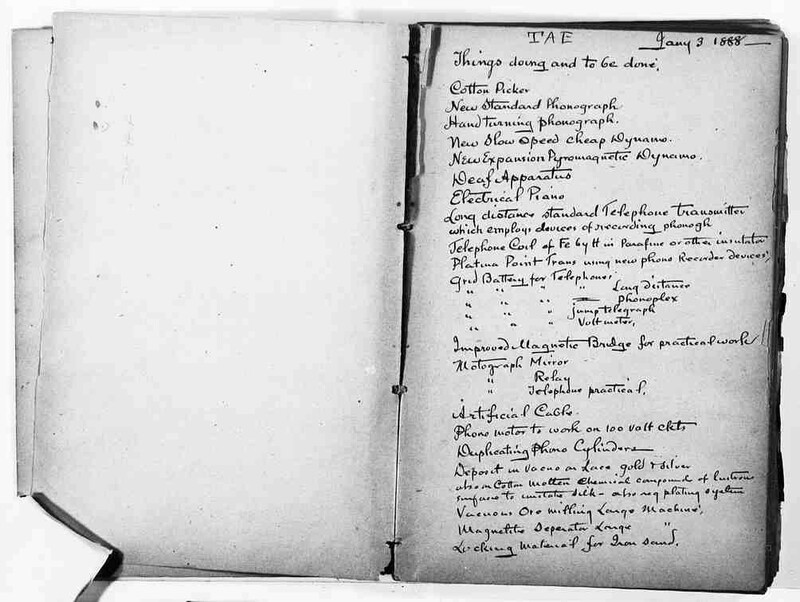 Edison was a prolific keeper of journals for all phases of the great inventions he created in his laboratory. Through it all, notebooks were a constant presence, capturing details about his inventions and the management of his labs. “If we did all the things we are capable of, we would literally astound ourselves.” Edison once said. Here is his famous to-do list, written in June, 1888. What we’re doing, is going through the archive–over five million documents, which we are editing, researching, and transcribing to better understand what was going on in the areas of research and business with which Edison was involved and to make these materials more accessible to scholars and the general public. This project has been at Rutgers for over 30 years. We thought there were about 1.5 million pages when we started working on them. The current estimate is now five million. And we have also located over 30,000 pages in other archives and private collections. If you enjoyed this post, you will love Postanly Weekly. It’s my FREE weekly digest of the best science-based productivity, and self improvement posts from around the web. And my best posts of the week. Join over 11k readers!